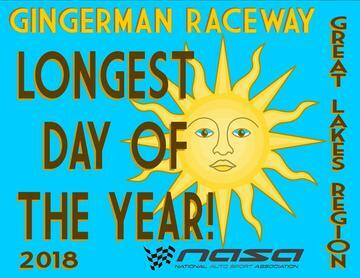 The tradition of this race is that it always falls close to the summer solstice. This is great news for you because the days are longer and there is no better way than to spend them racing with friends! For Complete Event Details, follow this link to the Regional Event Page. SAVE MONEY and Register EARLY!! Registration increases by $50 TEN (10) days prior to the event and an additional $50 on day of the event. 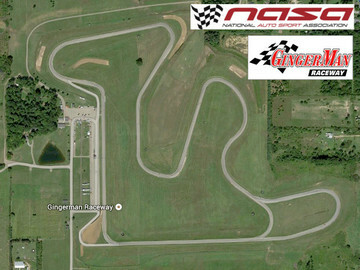 Friday Racer Test and Tune, Time Trial and Advanced HPDE hosed by GingerMan CLICK HERE. On-Line Registration - Officially closes at End-of-Day Tuesday night prior to the event. At Track - NASA Central/Registration. Hours can be found on the event schedule. Throw away the old shoe polish and blue tape!! NASA will have vinyl numbers for sale at the track. Visit NASA Central to get your numbers. We will have basic 10" vinyl numbers in BLACK and WHITE only. Numbers are $3 each, 4 digits for $10, or 6 digits for $15. Registration will also have race course outlines of the track from Rat Racing Graphics. HPDE groups 1, 2, 3 & 4 will not be timed - so please do not rent a Transponder for these classes. TT Classes WILL BE timed. PASSENGER SEAT is required for HPDE 1 & 2 and HIGHLY recommended for HPDE 3&4. If you registered On-Line, you DO NOT need to go to NASA Central again for registration at the track. Mandatory Driver's Meeting, see the Event Schedule for the time. You will be given a Driving Group Specific wristbands by your group leader after your Drivers meeting. 1-Arrive as early as possible! 3-Clean out all loose items from your car. 4-Go to Tech with Helmet, Tech Form and Car. Be sure your transponder number is correct in your user profile on NASAProRacing.com. By doing this, you ensure timing and scoring have the correct number when you register. If you need to change or give your number after registering, send it to the Registrar and we will update in the computer. Take care of any transponder issues now! A $25 fee will be assessed at the track for changes. Check the results after your first timed session to be sure you are being scored. You can rent a transponder from NASA, On-Line BEFORE the event, as we only have a few available. If you have rented one on-line, you can pick it up at NASA Central/Registration. Rental is $100 for the weekend. Sign Up On-Line under "Official". If you would like to volunteer for an event, we can find a fun exciting area for you participate in; Race Tech, HPDE Tech, Timing and Scoring, Flagger support, Grid and Pit, Registration, Customer support, etc.. Volunteers DO get closer to the action! Please don't be shy, EVERYONE is welcome!! Sign up On-Line and contact our Volunteer Coordinator. You may also visit registration at the track for more information. Camping is allowed for $10/Day/Person – Pay behind the food concessions area in the office called 8-1/2.